Inside: Eating out can be expensive, but we have tips on how to save money at restaurants. The best way to keep food costs down is to cook and eat at home. By doing so, you can control the costs, prepare what you like, and don’t have to wait to be seated. But, eating at home isn’t always possible and sometimes, you just want a break from the kitchen. Restaurants do tend to be budget busters for many families. Other than limiting the number of times you eat out at a restaurant, there are other ways we’ve found to control the costs and save money at restaurants. Markups in price on a beer, glass of wine, or even a soda is huge. The soda you are paying $3 at the restaurant would cost you less than $1 at home meaning it is likely over a 300% markup. And the alcoholic drinks? They are probably marked up even further. Enjoy a glass of ice water instead. Not only will you save money at nearly $3/person or more, but you will save on calories and avoid all the sugar. Water will keep the food flavors fresh and you can generally have as much water as you like. If your dinner would truly be enhanced by a particular drink, limit it to one and during the meal only. Otherwise, save your indulgences for when you are at home and can control quantity and cost. Meals at most restaurants are huge and will leave you overstuffed. You can save money and still leave satisfied by splitting a meal with another person. The meal can be extended further by ordering an appetizer to share as well. You will leave satisfied and your wallet will be happier. Some restaurants will charge a sharing or plate fee, so check before ordering. 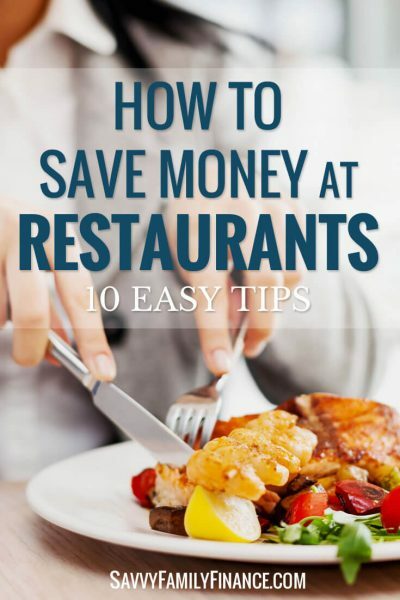 Even with a small fee, this is one of the best ways to save money at restaurants. Many restaurants have separate lunch and dinner menus. Sometimes the selection varies, but more often it is the price that changes. Dinners will be more expensive, so try going out during lunch. An added bonus? My husband and I found that popular restaurants with long wait times at dinner are often easy to get into for lunch, especially on weekdays. We get to try new spots without the wait and save money in the process. Sites such as Groupon and LivingSocial have great deals on restaurant gift cards. You can easily save upwards of 50%. Try also following your favorite restaurants on Facebook or Twitter as sometimes they may offer special discounts to followers occasionally. Happy hour isn’t just for drinks. Many restaurants offer some great happy hour deals on small plates and appetizers in the hours before the dinner rush or late-night. It’s a great way to sample dishes and save money. Be sure to also check bars associated with an adjacent restaurant as sometimes they will serve food during happy hour as well. Just like grocery shopping while hungry is a surefire budget buster, so is going out for dinner if you are overly hungry. What? Isn’t that the point? Well, if you are extra hungry, you are likely to order a couple of appetizers plus dinner plus drinks plus dessert. And if you have kids with you? Forget it. On the other hand, if you have a quick, small snack before going out, you won’t ruin your appetite, but it will take enough of an edge off that you won’t order more food than you really need. Try a bit of fruit or a handful of nuts as a small, healthy snack before going out. Another way to save money at restaurants is to get your meal to-go. This works even better at restaurants known for large portions. Order your entrée then at home, split it with your partner. For a couple dollars more, you can then prepare a nice salad and even include your favorite beverages. In the end, you’ve likely spent less than $20 for a very nice dinner. Some restaurants offer discounts to students, military personnel, or senior citizens. However, they won’t advertise that the discounts exist. Ask your server or host about discounts that may be available to you and you could save 5-15% on your bill. You can also buy discount gift cards to some restaurants. As part of our credit card rewards program, we are able to redeem the balance for discounted gift cards such as getting a $50 gift card for only $40. Some discount sites offer deals of more than 50% off. Try checking Restaurant.com or Cardpool.com for deals in your area. Warehouse stores such as Costco or Sam’s Club also offer bundles of gift cards at a discount. You can also often find BOGO deals in coupon books such as an Entertainment book or Chinook book. We get a Chinook book each year and use it to save money at restaurants and several other places. Just remember, the discounted cards will help you save money at restaurants only if you are actually going to use them. Don’t buy the cards for a deal you’ll never use. While the savings aren’t immediate or large, if you pay for your meal with a cash-back credit card, you will get a small percentage of the total back. Some cards will offer a flat percentage back for all purchases and others will offer higher percentages for certain types of retailers like restaurants. It doesn’t take much to reduce the cost of dining out so you can still enjoy the occasional night out without busting your budget. Try a few of these ideas and see if it helps your food budget without sacrificing the enjoyment of the food. How often do you eat out? What are your tips for keeping the cost down?